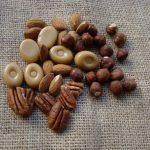 Have you found yourself reading coffee labels or coffee menus and thinking “Really this will taste of bluberries or maybe caramels or even nuts? and what you really want is a cup of coffee that tastes of …..um, well… coffee! Are you influenced by this description, maybe put off, or do you rush home to make a brew with anticipation, only to be left disappointed and feel like reporting them for trade descriptions! 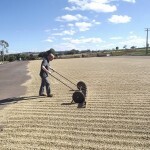 Is it a case of The Emperors New Clothes or is all the coffee geekery justified? Read on as I’m hoping to make the business of flavours make a bit more sense. Our coffee drinking habits vary, for some it’s a ritual, a ‘fix’ before functioning, for others it’s a social activity where the focus of attention is on the ‘Chit Chat’ and not necessarily what’s in the cup!! However times are changing, The Third Wave Coffee Generation is all about appreciation, noticing what you are drinking and it’s origins. As individuals become more knowledgeable and discerning as will the opportunity to choose your beans and brew methods. So that you can participate and decide for yourself I’ve diluted the geekery to awaken your tasting and smelling senses. Let us commence with the seed…..
Coffee plants thrive either side of the equator along a recognised ‘Coffee Belt’ otherwise known as the Tropics. 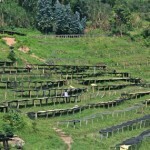 The conditions are; rich soil,moderate sun & rain @ 20 oc and up to 2000 meters a.s.l . The altitude, geography, climate and terroir can influence the flavour profile in this early stage. The coffee industry deals with 2 species of coffee plant; Arabica & Robusta. Arabica is considered to be the superior bean with plenty of flavour . It is these nuances of flavour that we are aiming to identify. The 2 varieties of Arabica are Typica & Bourbon, which in turn have produced mutations & hybrids such as; Caturra, SL 28, Mundo Novo and Catuai to randomly select a few examples. Farmers are now seeking out favourable qualities & cultivating species for desirable features & flavour profiles. Robusta on the other hand is high in caffeine with less flavours, it can be found in some espresso blends and can be used to add some extra kick. Despite the Green Bean containing these flavour profiles, in it’s current state it is a fairly tasteless hard seed – if eaten reminds me of chewing hay stalks! They are however made up of carbohydrates, sugars, water, amino acids, fibre, proteins, organic acids, minerals, lipids; caffeine & trigonelline which are both alkaloids & responsible for the bitterness. It is these ingredients along with hundreds of other chemical compounds which are waiting to be released. I found this handy pie chart which helps to visualise the make up of ingredients. 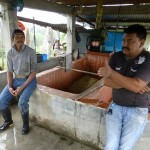 Once the beans are ripe and harvested the next stage to influence the flavour profile is the processing. Processing is removing the layers of skin, pulp & mucilage from the seeds and has a profound effect on the flavour of the Green Bean. There are 3 ways and these too are being included in a coffee description . Farmers currently tend to choose a method depending on finances and natural resources available, rather than the potential flavour profile. NATURAL – The fruit is left intact & laid out on patios to dry. This can take many weeks & care is taken not to let rot/mould or fermentation set in. This process allows the fruits sweetness to transfer into the seed. Once the flesh has become dark, shrivelled up & dry, it is peeled off the bean. 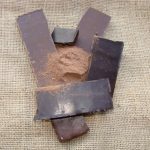 The resulting flavour is said to be complex, rich bodied, with sweet & wild berry flavours. 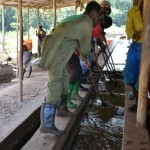 WASHED – The soft flesh is literally washed off leaving a sticky shiny mucilage attached to the stone. This contains sugars & pectin & has to be soaked off, followed by a period of fermentation. The fermentation process ranges from hours to days & needs to be managed well in order to obtain higher acidic coffees – as seen with Kenyan coffees. SEMI WASHED – AKA: Honey Processed & Pulp Natural. These are a combination of Wet & Dry processing. After the pulp has been removed the mucilage is allowed to dry around the bean for 5 – 14 days. The end results are characteristics nearer to the dry process – giving a lot of body but low in acidity. Are you beginning to get a feel for the complexity of this coffee business AND I haven’t got to the roast or the brew yet!! We now have Green Beans bursting with fats & sugars, acids & alkaloids, but in order to transform this into a palatable flavoursome format for us to enjoy they need to go for a roasting!! The science behind the roasting process and the reactions that take place are complex, therefore I will be brief and move on quickly! It is the roasters responsibility to unlock the beans potential, dictated by the desired finished product & it’s intended brewing method. Roasting a bean is similar to roasting other foods, in general….underdone it is raw and green, overdone it is caramalized and smokey, neither are to everyones liking! A fine balance is required between the cooking temperatures & time in order to achieve the desired flavour profile. 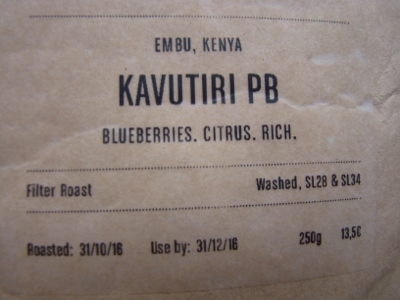 The Third Wave Coffee movement is experimenting with lighter green roasts, by shortening the roasting times in order to pick up on the nuances of flavour and appreciate the characteristics of the beans origins. These beans are then brewed in a manner for us to best experience the flavours. For example drinking an espresso will give you a better chance of finding your blueberries than a cappuccino. Green beans that have been roasted for longer will become more developed, bringing out or introducing other flavours, which can be heavy and smother the lighter notes. Sensory Analysis have you heard of it? – that’s the scientific discipline used to evaluate coffee’s characteristics. It combines the use of all the senses, however it is Taste + Smell that give the flavour perception of coffee. At The Manchester Coffee Festival The guys from Origin Coffee were conducting an experiment to demonstrate how that equation works. I used a Jelly Bean and a Coffee Bean, pinched my nose tightly whilst eating – noting it was tastless, on releasing the nose the flavour exploded becoming apparent and much easier to identify. The ‘Coffee Tasters Flavour Wheel’ is a resource used in the industry to analyse and describe coffee flavours. On first glance it is an overwhelming mass of nouns, but it has been cleverly designed to make evaluating the taste process simpler. Coffee Cuppers, (‘Cupping’ being the professional term for tasting coffee) base their assessments around Sweetness, Acidity, Aroma, Mouthfeel & Balance. It is easy enough for you to replicate at home. When you are out and about drinking coffee sticking to black coffee makes it easier to pick up on the flavours. The wheel is designed with the Generic flavours forming an inner circle, as you become more skilled in your ‘sensory analysis’ you move outwards. If you can identify the generic flavours then you are well on the way to being able to ascertain what you do and don’t like in a cup of coffee. I find acidity and fruits hard to identify. This is partly due to pre conceived ideas and expectations but also because acid comes in different forms (- there are over 30 in roasted coffee) for example Citric, Malic, Lactic and Acetic. Acidity is a vital ingredient to a good cup of coffee but it has to be balanced correctly along with the sweetness & bitterness. For more detailed info see http://legacy.sweetmarias.com/library/weblog/what-acidity-regards-taste-coffee. 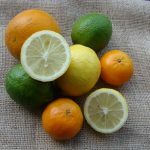 When I first began ‘cupping’ I had a tendency to group all acidic flavours as citrus, until I had my own ‘Eureka’ moment! Whilst researching for this ‘Chatterbox’ feature I was concentrating whilst eating Blueberries and Raspberries and did notice the tartness. Hang on a moment I thought, that’s acidity! But it can’t be, these should be sweet & yummy & eaten with cream & meringues and are deliciously sweet!! At this point i went to look at the flavour wheel and yes there they were – Blueberries and Raspberriess tucked in between Cranberrys & Blackcurrants – at last I’ve found you! Although I must admit that I couldn’t actually identify the blueberries as a flavour but I was able to find the ‘Berry Fruits’ notes ……or maybe that idea was put in my head!! 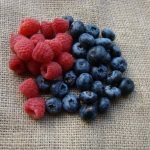 Although these fruit flavours can be present in the cup, it is very easy to have swallowed a mouthful of coffee whilst chatting with a friend or looking at a screen and you have missed it! It may be that you want an all round good mouthfeel with flavours that YOU like and asscociate with a good cup of coffee. As it is coming down to personal preference we are lucky to have such a wide choice of coffees made available through independent coffee shops and even the supermarkets are becoming receptive to the smaller roasters. I hope now, that Coffee Lables and Menus will make a little more sense to you and you will feel confident to begin really tasting what is in your cup. If this has awakened your desire to become more knowledgeable there are plenty of resources and courses available. Just one last little reminder – the barrista is instrumental in the final stages and a potentially good flavoursome brew can be ruined! Hey Hoy the joys of coffee geekery!! 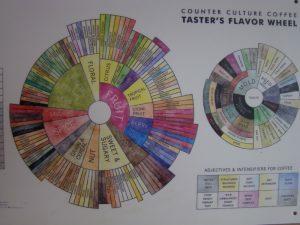 Visit https://sca.coffee/ The speciality Coffee Association for a list of providers of Sensory Analysis Courses.